General Mattis would make the greatest President since George Washington. At least that is how my last article on General Mattis started. 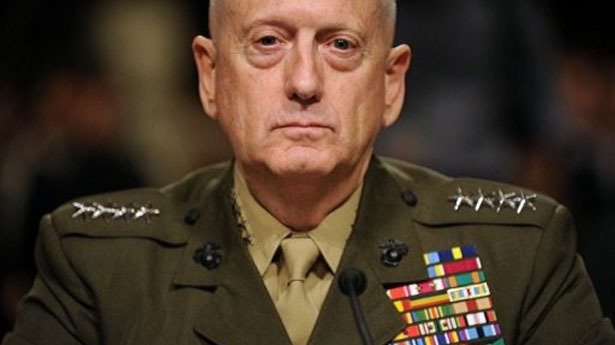 Less about my writing and more about the credentials of the man himself, my article Top 5 Reasons General Mattis Should be President was shared over 30,000 times on social media and viewed over 80,000 and still climbing. Now, I say all this not to brag about that article. Rather, I say that to let you know that what we seek is actually in reach and reasonable. You see, it is time to kick it up a notch. And while the desire for a General Mattis Presidency is real, it sadly doesn’t appear that he is interested. And just like Emperor Marcus Aurelius told Maximus in Gladiator, “That is why it must be you Maximus.” Consequently, at the end of this article I am going to ask you to sign a White House Petition. This petition asks one simple thing of the White House. Namely, invite General Mattis over for a 2 year sleep over. That’s it. Now, let me be clear, this is not a political ad for Mattis 2016. The White House petition forum doesn’t allow for candidate endorsement. Thus, I am not asking for President Obama to endorse General Mattis. Nor am I asking him to cede power to General Mattis. Rather, I am just asking the President to let General Mattis have a 2 year slumber party. Think of it Mr. President, General Mattis can regale with stories of slaying bodies and you can regale him with stories about how mean Putin is to you. Look, any room will do Mr. President. I know they have guest rooms such as the Lincoln bedroom that were made famous in the Clinton Presidency. In fact, I am willing to bet President Clinton made every room in the White House famous if you catch my drift. 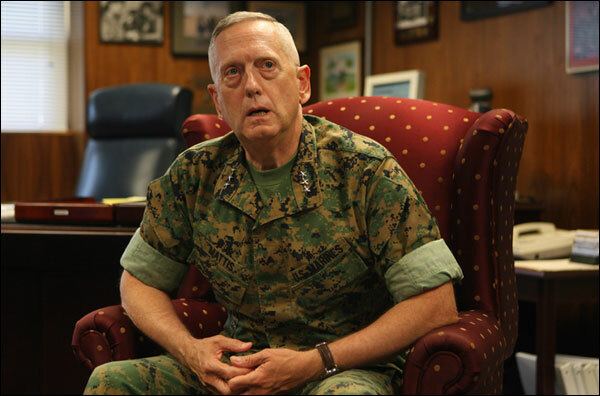 However, General Mattis is a warrior and you could just as easily set up an OD green military cot for him and he would be fine. You see, just having Mad Dog Mattis there brings with it inalienable benefits for all. The White House could finally stop this whole fence jumper problem as they will finally be able to put up a sign on the fence that reads, “Beware of Dog”, and do so with integrity. In fact, might I suggest just putting up a cot in the White House situation room. You know that scene in Tombstone where they are heading towards the OK corral? Wyatt asks his brother to give Doc Holliday the shotgun under the premise the enemy would be less likely to feel quarrelsome knowing Doc is at the helm of that weapon. Well, same premise here. I am not saying that would end the ISIS threat, but General Mattis in the situation room might honestly make a job at Habib’s Taco shack look like a better alternative to ISIS. Then we can say jobs won the war and it’s a win for everyone. Seriously, the White House will have to respond if we get 100,000 signatures. About a year or so ago, there was a petition for the United States to begin construction of the Death Star. Now, when I first heard that, I just assumed the Death Star was that twinkle in General Mattis’ eye. However, as it turns out, they were just talking about the Death Star from the movie Star Wars. Very disappointing, but none the less, the White House responded. You see, as I mentioned earlier, General Mattis does not seem to express any interest in becoming President. Thus, while we all seriously would love to see it, at this point it is a long shot reality. However, who is to say that if General Mattis sets up shop in the White House that he doesn’t just choose to stick around in 2016 and run for office. After all, no one likes to move and General Mattis doesn’t like to retreat. Honestly, even if he didn’t run, we could at least send a message to America about the type of leader we seek. We seek a leader whom has been mastering his field rather than seeking the next political office. We seek a leader who is honest and candid with his words rather than worrying about a political gaff. We seek a leader who will instill confidence in a nation troubled by partisanship and indecision. I’m sorry, but no one in the current field of candidates comes to mind. Let’s make the White House respond to this idea of a 2 year sleepover and who knows. Maybe, just maybe, General Mattis gets a little comfortable at 1600 Pennsylvania Avenue. Sign the Petition. Share and Spread the Word. Sign up by email below to receive more articles from Unprecedented Mediocrity and Updates on the status of the petition below. Or Follow the Unprecedented Mediocrity page on Facebook. Mattis is an inspiring field commander held near and dear to those closest to the point of the spear. Now, as we move toward 14 years of war (they weren’t kidding when predicting new types of threats and asymmetrical warfare) he’s exactly what we don’t need. We could use a George Marshall, maybe the greatest military ‘talent scout’ ever to find another Eisenhower; a low key coalition builder who could handle eccentric personalities like Montgomery, Patton, “Bomber” Harris, and de Gaulle. And more importantly, the definition of success this time isn’t static; there’s no triumph of arms and then we go home. This time we need to take the long view and the broad view. Measurable progress needs to be set on a path of constant improvement that can sustain itself as a dynamic process. The personnel needed to win the military engagements stands at a fraction of those needed for civil affairs (uniformed outnumbered by plainclothes; indigenous vastly outnumbering Westerners). The tiger vs. tail ratio for the US in the Pacific theater of WWII was 1:17. What we do to fix this mess should be similar in appearance to present day adversaries — they shouldn’t see more than six of every hundred Americans working to take them down. Logistics, intelligence, and other areas of combat support should occupy our military to a far greater extent than direct action. A force equivalent to the 75th Ranger Regiment – 3 crack battalions, is the extent of any combat role for us in my opinion with one condition; we work ourselves out of a job in the time it takes to create a force equivalent (Jordan has the cadre and the Kurds have ‘the willing’).